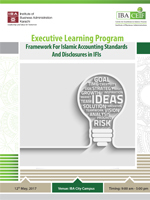 IBA Centre for Excellence in Islamic Finance is pleased to off¬er a one-day course on Islamic Accounting Standards and disclosure requirements in Financial Statements of IFIs. The course is uniquely designed for participants seeking to develop an understanding of the Accounting standards which have been approved by ICAP and implemented by IFIs locally. The course also demonstrates, through case studies and interactive exercises, an understanding of disclosures apt for Islamic modes of financing. Mr. Omar Mustafa Ansari is the Deputy Secretary General at the Accounting and Auditing Organization for Islamic Financial Institutions (AAOIFI). Previously he was Partner at Ernst & Young Ford Rhodes Sidat Hyder. Mr. Omar's key area of expertise is Islamic Accounting advisory, Shari'ah Audits, Corporate Finance Advisory, Structuring of Shari'ah Compliant Transactions, Financial Modelling and Risk Management. He is author of two books on Islamic Finance, namely "Managing Finances - A Shariah Compliant Way" and "Islamic Microfinance Bank: Working Model".